With the ever increasing trend of Scalp Micro Pigmentation in Australia we at The Shadow Clinic are seeing a wider range of treatment techniques and results evolving in the market place that are not necessarily correct or satisfactory. We also notice some businesses play on fear tactics to gain their clients by claiming they offer a hole proof product but Joe Bloggs down the road certainly does not. Claims without backbone knowledge or reference. Our advice if you are considering this treatment, are not sure who to go with or simply just want more knowledge on Scalp pigmentation is to call us at The Shadow Clinic. Proof is in the pudding and the best proof is to meet one of our past clients and see SMP in real life. We will hook you up with past clients that had treatments more then a year ago to see aged results. After-photos or seeing clients immediately after SMP may look fine as the ink has not had time to settle but preferably for your own peace of mind witnessing aged results will give you a more precise future outcome. Overall and or irregular fading of the treated area within a year. Dots increasing in size and what we at the shadow clinic refer to as “raisins”. Pigments/Inks changing from the initial colour applied to a bluey greeny hue. All clients need to know and trust SMP treatments will stay natural looking , virtually undetectable next to existing hair if any and very importantly keep true to colour. We can offer this to you. We have past client’s more then happy to show you their Scalp Pigmentation results dating 2,3 4 years down the track. You can get proof in the pudding that your treatment results new and old will look fantastic. The Shadow Clinic pride itself on being the Australian innovator and leader in Scalp Micro Pigmentation delivering the experience, history and results you want. Hey Buddy!, I found this information for you: "Meeting up with past scalp micropigmentation clients". 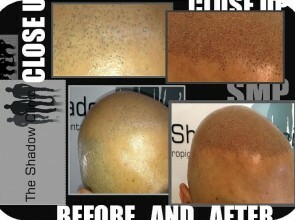 Here is the website link: http://www.theshadowclinic.co.nz/meeting-up-with-past-scalp-micropigmentation-clients/. Thank you.